I have always had a fascination with South America. It could be the indomitable Latin spirit, its darkly handsome men, the mournful Tango or maybe the proximity to the end of the world – I’m not sure what holds me in a thrall, but it just does. When the W Doha asked me to attend their special Sommelier’s Dinner, themed around the wine and food of Chile, it was a no brainer. My dance card suddenly cleared. The dinner was centered around the food of Chile in honor of the outgoing Chef of Market, Rodrigo. He told me at the dinner he had been keen to showcase the food of his homeland, with its emphasis on seafood. The wines were provided by Casa Silva and were carefully selected by W’s Aussie sommelier and all round fab chick, Trasy. What would a LOTW post be without cheese? 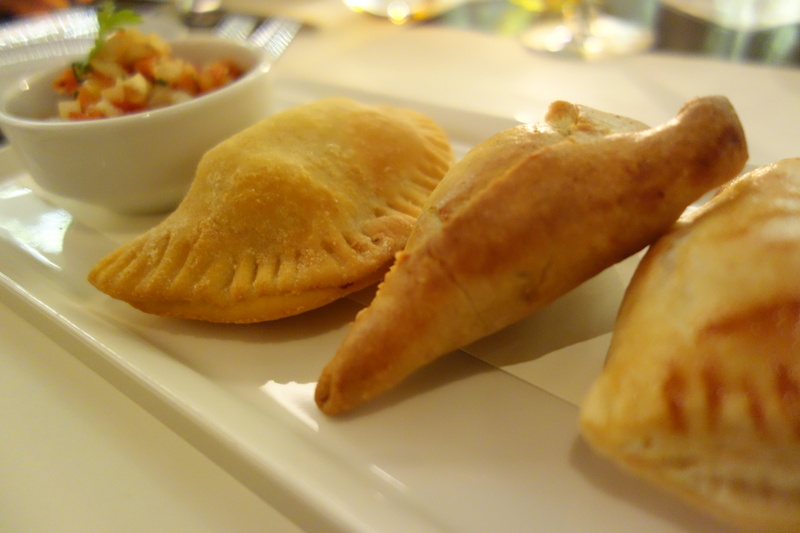 My hit came in the form of the renowned empanadas. The trio represented a road trip across Chile, from the south to the north and back again in meat, seafood and fried prawns with corn and cheese. All encased in a delicate pastry. These were demolished by my own dining triumvirate within minutes. These were paired with a sparkling wine with cherries added for a Chilean flavor – Cherries are one of the biggest exports of the country. 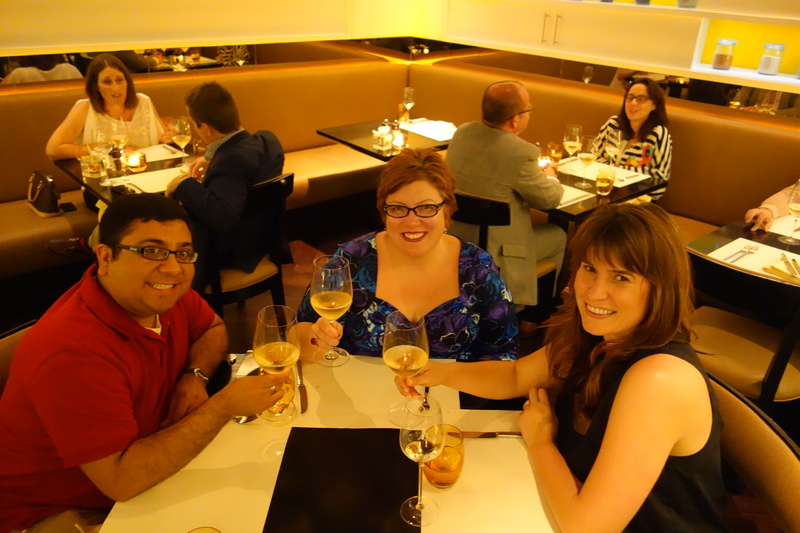 My dining companions for the evening were my erstwhile partners in cheese crime – Jen and Jamie. Worthy allies in this assault on the senses. Conversation ranged from gossip to Kim Kardashian’s baby daddy to the art world and of course, the wine and food. Trasy informed us that although Chile is considered the “New World”, wine making has been a way of life there for hundreds of years. Cheers to that. The next course took us to the long strip of the Chilean coast. 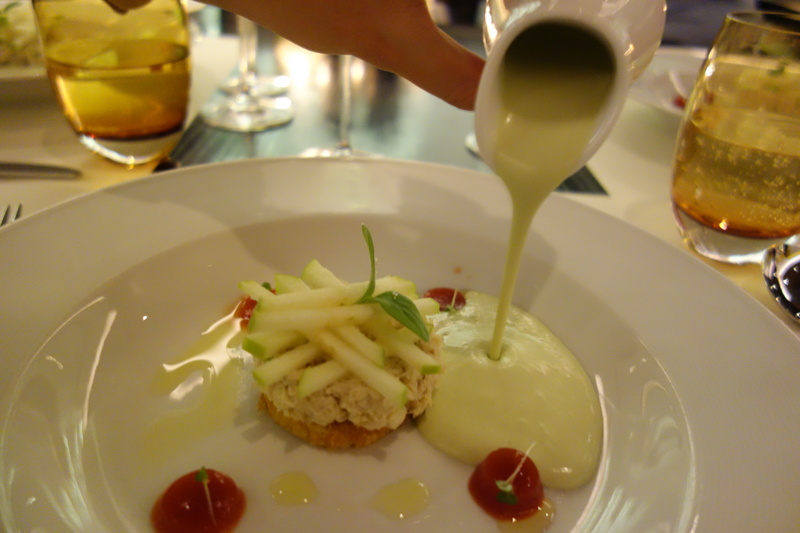 The crab salad with apple and smoked vanilla mayonnaise was lifted to new heights by the addition of the avocado soup. A riot of textures and flovors, it was gamely matched by the Casa Silva Chardonnay Semillion. And now for something from Chef Rodrigo’s childhood. 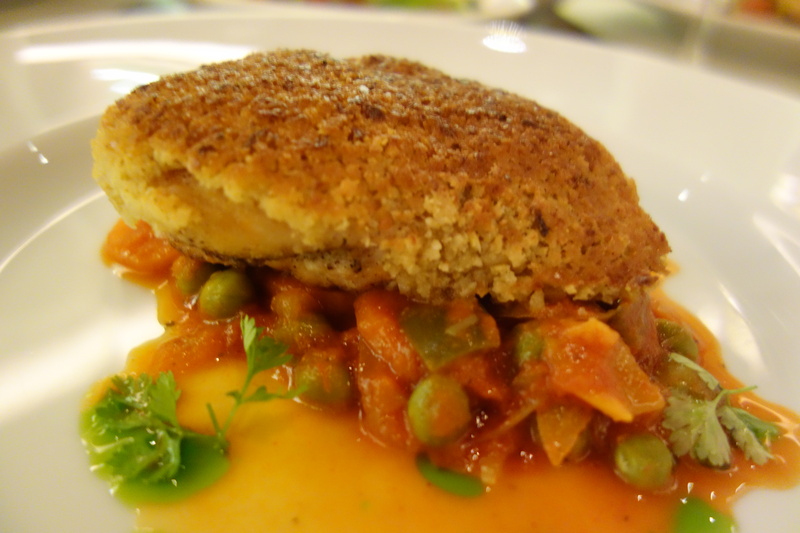 Chicken and peas is a staple in Chile and the chef gave us a unique play on it with the pollo crusted with Araucaria nuts. These nuts are similar to large pine nuts, and are extensively harvested in Chile. 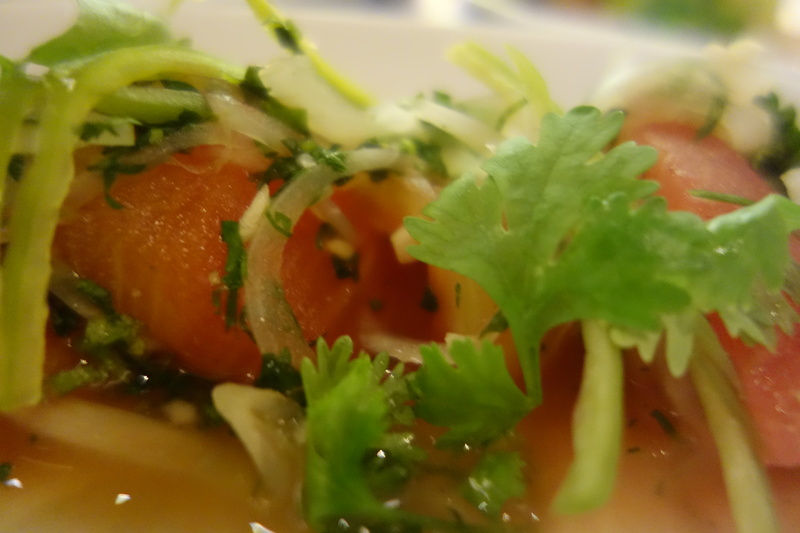 It was served with a tomato and onion salad simply dressed with vinegar and chili. 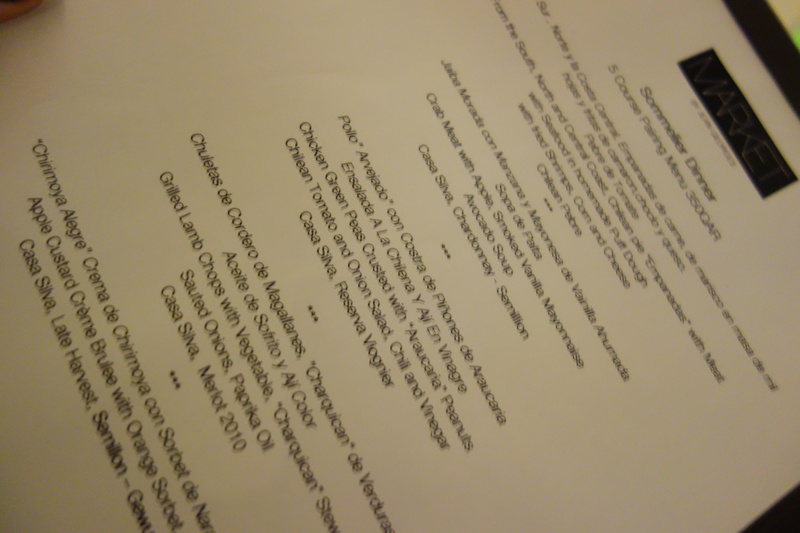 The wine paring was one of my favorites, the Casa Silva Reserva Voignier. This is an aromatic grape variety known for producing textural white wines with strong stone-fruit flavors and was very “floral”, even with a hint of lavender. 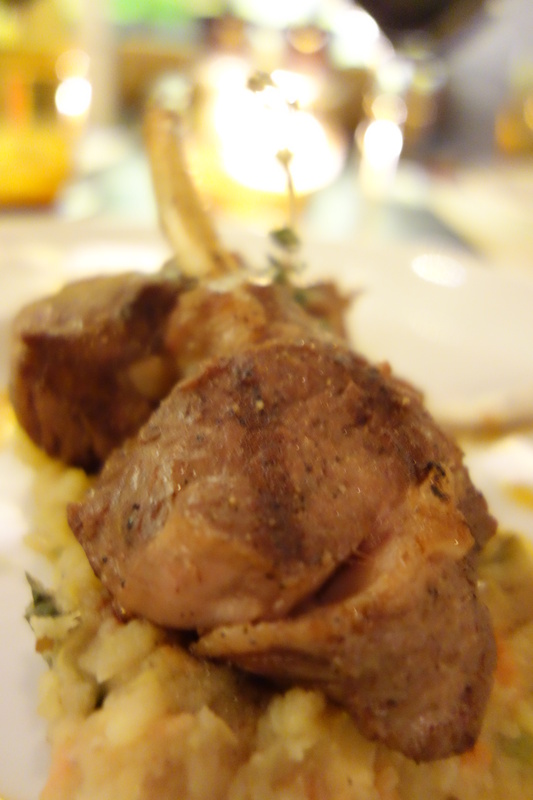 As with seafood, meat is also a staple of the Chilean diet. Pork is the most popular meat, but given the sensitivities of the region, our menu featured medium lamb chops with vegetable and Charquicán stew, sauteed onions and paprika oil. Charquican is a Chilean dish, containing potatoes, minced meat, pumpkin, white corn, onion and in this case, peas. This was of course paired with a Casa Silva Merlot. You had me at lamb and red wine. At this stage, I would usually be discretely asking for a hunk of cheese rather than dessert. But outlet manager Stavros convinced me to try the dessert offering. Am glad I did. In australia we have a fruit called the Custard Apple and in Chile this is called the Chirimoya Alegre. 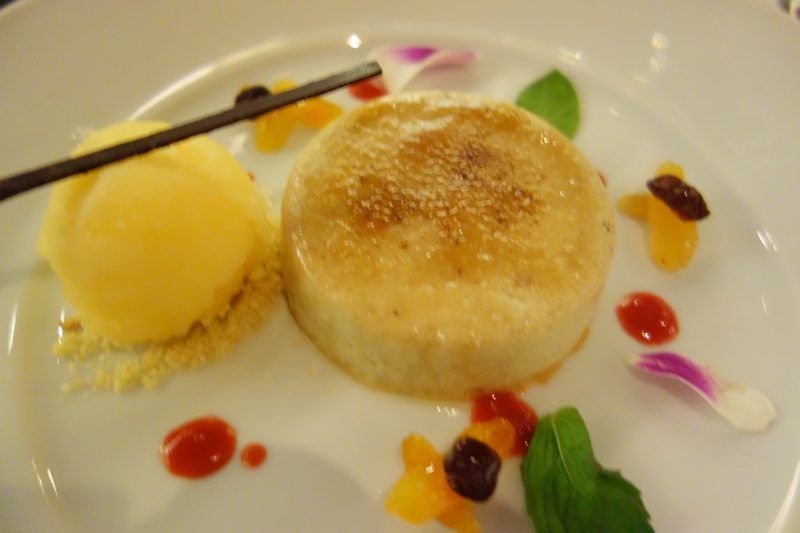 Chef Rodrigo has taken this sweet fruit and made it into a crem brulee. The organe sorbet cut through the sweetness. The result was almost too pretty to eat, even for this hardened cheese lover. Paired with a Casa Silva Late Harvest Semillion Gewurtztraminer. The combination may almost have converted me. Chef Rodrigo is taking his Chirimoya and Araucaria and heading to China. I’m grateful he was able to take us on one final journey before he embarks on his own. Chau!